New Community Engineering Corps Will Assist Underserved Communities in the U.S. 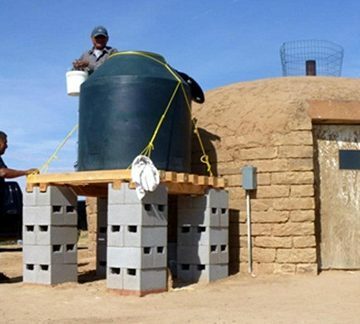 The Black Mesa Water and Sanitation Project in Black Mesa, Arizona, is one of the pilot projects conducted as part of the Community Engineering Corps initiative. For the past 20 years, the rising waters from Devil’s Lake Basin have caused flooding and environmental and economic impacts on the 245,000-acre Spirit Lake community, home to the Spirit Lake Tribe reservation. The loss of several hundred farms and prime agricultural real estate and extensive damage to road, sewage, and power infrastructure led the state to declare the 78,000-acre Spirit Lake Tribe reservation in Benson County, North Dakota, a disaster area in April 2013. The Tokio Pantry, which has served as a food distribution and community center for the entire Spirit Lake Nation, was forced to shut down and be demolished because of mold issues from flooding and an insufficient septic system. FEMA has been working with the tribal community to implement an emergency plan, but that is not enough. Coming to the rescue of the Spirit Lake Tribe with plans to construct a new community center later this year – which will play a key role in restoring their community – is the Community Engineering Corps (CE Corps). A partnership between ASCE, the American Water Works Association (AWWA), and Engineers Without Borders–USA (EWB), the CE Corps will help underserved communities in the U.S., such as the Spirit Lake Tribe, by providing volunteers, resources, and engineering expertise. The Spirit Tribe Community Center is one of the first 5 pilot CE Corps projects, and was originally initiated by the EWB Central Houston Professional Chapter in 2013. “ASCE has been partnering with EWB-USA for over 5 years now,” said ASCE President Randall “Randy” S. Over, P.E., F.ASCE. “Supporting them financially as well as providing support services to their operations. And we believe this domestic program – the Community Engineering Corps – is really going to engage our members. And, in particular, [through] helping infrastructure right here in the U.S. in underserved communities. We have been looking for a way to do that. 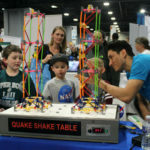 “The Community Engineering Corps is an alliance between ASCE, AWWA, and EWB-USA that does pro bono engineering services to communities in need here in the Under States,” says Peter Waugh, P.E., M.ASCE, EWB-USA’s domestic program director. “EWB-USA has been working overseas for about a dozen years but here at home we had all sorts of underserved communities that needed technical assistance and didn’t have the financial resources to access that. D-Q University Infrastructure Assessment in Davis, California, insinuated by the EWB-USA University of California, Davis Student Chapter, will conduct an assessment of the university’s building facilities and water system, which presently cannot meet the community’s needs. Black Mesa Water and Sanitation Project in Black Mesa, Arizona, developed by the EWB-USA Georgia Institute of Technology Student Chapter, will provide their community with a better water supply, greener technology, and reduce their energy usage. Friends of Halawa Xeriscape Garden, in Honolulu, Hawaii, in coordination with the EWB-USA Honolulu Professional Chapter, will safely expand the garden so both residents of the City and County as well as visitors will benefit from the education programs and resources. Tulane City Center Hollygrove Greenline Project in Hollygrove, Louisiana, organized by the EWB-USA New Orleans Professional Chapter, will provide the community with a linear park facility that will include storm-water retention areas and increased space for agriculture, and provide new uses for this underutilized green strip. “These are the projects that convinced us that [CE Corps] is indeed a viable project and we should go to full scale,” says Waugh. Similar to how EWB-USA presently operates with their international projects, an application for a CE Corps project will come from a community group or a nonprofit organization that represents a community. The application will include information about the program eligibility requirements and the criteria against which the application will be judged. The review of the application will take approximately 4 to 6 weeks. 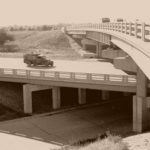 If the application is approved, CE Corps will identify a section of ASCE or AWWA, or a chapter of EWB-USA, that is best suited to work on the project. Next, the Corps will connect the community with the volunteer engineers who will be working on the project. I am intersted in finding out more about this group. Is it possible to forward my email address to this group. I live in North Dakota and am just learning about this opportunity to serve. Fascinating. Related to the new Community Engineering Corps….. Sounds to me like exactly what was envisioned with the Community Engineering Corps.